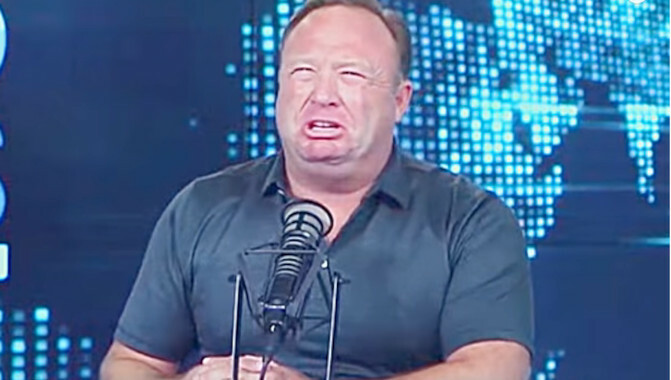 Alex Jones on a rant. Here are some quotes from radio host and conspiracy analyst Alex Jones. "Hitler took the guns, Stalin took the guns, Mao took the guns, Fidel Castro took the guns, Hugo Chavez took the guns. I'm here to tell you, 1776 will commence again if you try to take our firearms! It doesn't matter how many lemmings you get out there on the street, begging for them to have their guns taken. We will not relinquish them! Do you understand?" Source: CNN's "Piers Morgan Live," January 7 2013. Source: "Alex Jones Show" February 8 2016. "A lot of people are waking up to human history, but so many people have been conditioned by the government controlled media to think that it's cool not to care." I grew up in Dallas, Texas, drinking sodium fluoridated water. All the scientific studies show my IQ has been reduced by at least 20 points. The shadow of who I would have been calls out from the grave. Source: Question Your Reality, February 11 2008. The reason there are so many gay people now is because it's a chemical warfare operation. I have the government documents where they said they're going to encourage homosexuality with chemicals so people don't have children. Source: Alex Jones Show, June 2010.